Most SEM agencies calculate their rates as a percentage of ad spend. It puts you (the customer) at a disadvantage because it incentivizes agencies to inflate your account, not improve it. When agencies are paid this way, spending more benefits them. To fix this problem many customers manage based on return on ad spend, but then you’re constantly looking over your agency’s shoulder. Let’s rethink the way we calculate the rates in the first place. A big benefit of SEM is that it provides access to tons of telling data. Wouldn’t it make sense to employ all this information to come up with a more comprehensive definition of success and a better payment model? For this task, it makes sense to look beyond ad spend and even beyond return on ad spend. That’s because ROAS tells you about profitability but says nothing about volume. Taken alone, ROAS can be misleading. For example, let’s say you’re happy with an ROAS of 400%. In this case, your ad spend could be $2,000 and revenue$8,000, or you could have an ad spend of $500 and revenue of $2,000. Both these cases satisfy your requirement of an ROAS of 400%, but the difference in total profit is a whopping 75%! While ROAS is important, it clearly can’t stand alone as a metric. In order to get a truly comprehensive and robust indicator for success, both growth and profitability must be taken into account. In addition, if we are including all of these different factors, then our metric might become bloated and sloppy. Ideally, we would like to keep the math nice and neat by working with just a few existing categories of information that are standard in SEM reporting. This formula solves all of our problems; it takes all of the relevant factors into account, and does so in a deceptively simple manner. Where ROAS was lacking was that it didn’t take volume into account. 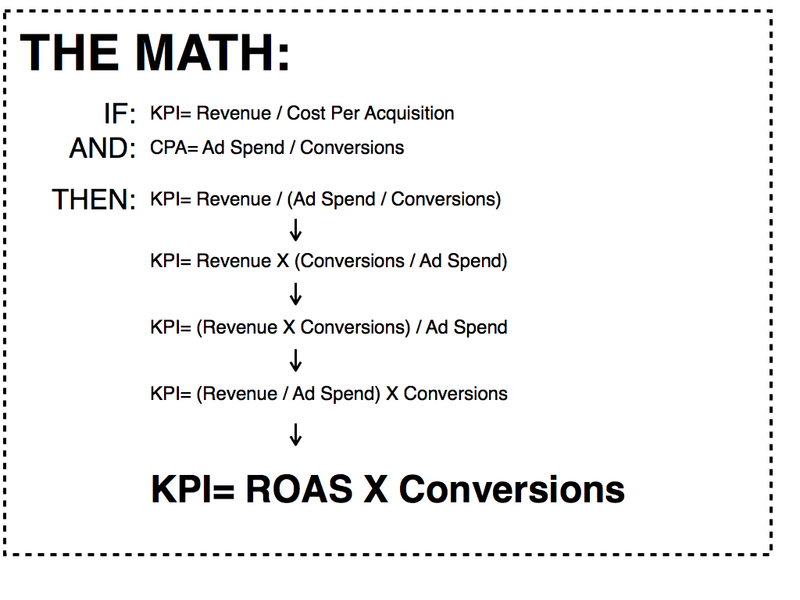 In case you needed a refresher, the formula for ROAS looks like this: Revenue/Ad Spend. Essentially, ROAS only has two dimensions, and completely ignores the third factor of volume. Ok, so that math may be scary, but all it’s saying something fairly simple. Using the Rev/CPA model not only accounts for the two factors included in ROAS, it explicitly links them to the third dimension of volume. Using this metric allows all three key factors of SEM performance to be understood and examined in relation to each other. The benefits of calculating rates according to this formula are fairly straightforward. Those points alone should make the case pretty strongly, but if you’re looking for something more convincing, try and understand what embracing this model would mean for the SEM industry as a whole. Search engine marketing is data-driven by nature, and there’s no reason why the calculation of rates should be as scholastic as it currently is. The formula being proposed is not an ending point, it’s a starting point. This is clearly not an idea in its finished state: there is always room for improvement and revision. But the emphasis on constantly analyzing and redefining how success is measured is a step in an entirely new direction. It is a step agencies should embrace and customers should demand. Not just because it is a more fair, balanced and logical approach--but because the old way just doesn’t make any sense.